KM3NeT will be the next generation neutrino telescope, on the floor of the Mediterranean Sea. The relevance of such a detector was recently confirmed by the detection of cosmic neutrinos by the IceCube experiment at the South Pole. KM3NeT will have a higher resolution and will be able to study this signal in greater detail. Neutrinos can be detected by measuring Cherenkov light, that is caused by the reaction products of neutrino interactions. In KM3NeT the Cherenkov light will be detected using a new type of optical module: a glass sphere that contains 31 small photomultiplier tubes (PMTs). This is different approach from other neutrino telescopes that contain a single large PMT per optical module. This new multi-PMT module has, besides other advantages, a better net price per sensor surface. 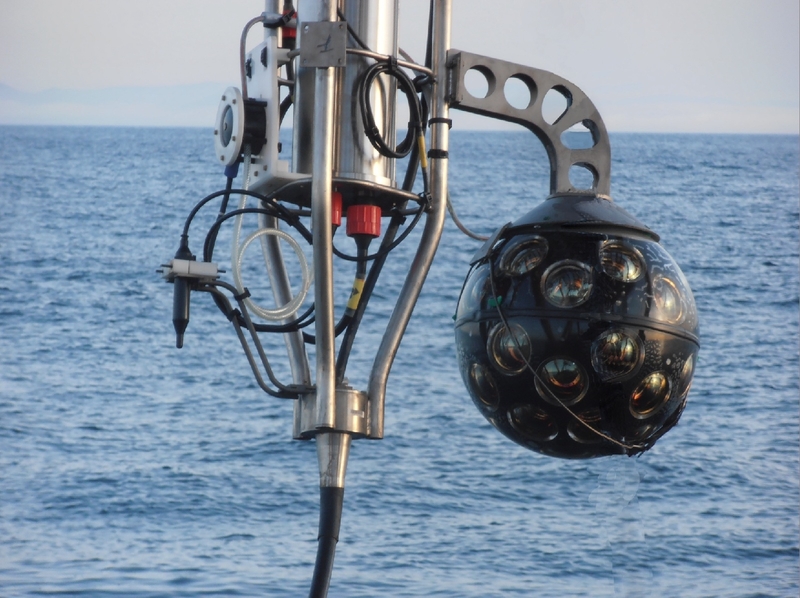 In April 2013, the KM3NeT collaboration sunk the first prototype optical module in the Mediterranean Sea at a depth of 2.4 kilometres. Communication with the coast takes place via a forty-kilometre long submarine cable, which is part of the existing Antares detector. All 31 PMTs have since transmitted data to the coast without any problems. Analysis of the data from the prototype has confirmed the strength of the multi-PMT concept. The optical background, which is caused by radioactive sea salt and bioluminescence, can be better understood because different PMTs detect the light at the same time. Simulations have revealed that cosmic muons cause events for which the number of tubes simultaneously detecting the light is greater than six. Many of these particles have already been detected. It is even possible to determine the direction of the muons by examining which tubes have detected the signal. If such techniques are applied in the final KM3NeT detector then the identification of cosmic neutrinos will improve. The KM3NeT collaboration currently has funding for the first phase of the entire neutrino telescope. This first phase will consist of about 500 optical modules and will be realised over the next two years. The first KM3NeT multi-PMT optical module just before it was sunk. The module is attached to a line that is part of the Antares neutrino telescope. The individual PMTs are visible.